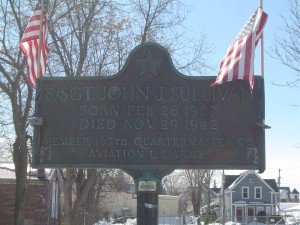 Photograph of J. Roger Raymond recognition plaque, located in Manchester NH at the southeast corner of Queen City Ave and Second Street. Joseph Roger Raymond was born on 2 January 1921 in Manchester, Hillsborough County, New Hampshire, the youngest of 5 children born to Joseph Alfred & Lydia (Dubois) Raymond. His parents were Canadian immigrants who came to Manchester seeking jobs, and his father worked as cobbler [repaired shoes]. Roger grew up in a house at 475 Second Street, on the west side, and graduated from the local schools, including Sacred Heart Grammar School, and West High (Class of 1939). He was active in sports and played on several local base ball teams. The Manchester (NH) City Directory of 1941 shows his occupation as a shoe worker, and that he still lived with his parents. The next year (1942) the directory shows him in the military. 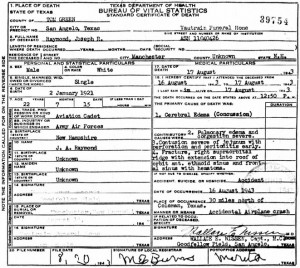 Death record of Roger Raymond. Roger’s body was send home for burial, which was performed with full military honor on 23 August 1943 at Mt. Calvary Cemetery in Manchester NH.